Saxo Bank CIO and chief economist Steen Jakobsen made a few comments the other day that hit me in the face like a bucket of ice water. Here they are again, taken from Steen Jakobsen Warns "Euro is Not a Good Idea and ECB About to Make Biggest Mistake in History"
That paragraph stood out because Michael Pettis at China Financial Markets has made similar statements about interest rates in China. Please consider this snip from Pettis on Strains in China's Banking System; Avoiding the Fall (an excerpt from Taking Stock of China’s Transition by Michael Pettis - via email - no link available - emphasis in italics mine). In cases where consumption is a relatively small part of total demand, in which household savings are high and tend to occur in the form of bank deposits, and especially if most new credit is allocated to producers rather than consumers, lower interest rates actually reduce consumption by reducing household income (lowering the return on savings), and increase production by lowering financing costs for producers. The same can happen with currency depreciation, which reduces disposable household income by raising import prices while subsidizing the tradable goods sector. In cases like China and Japan, the net effect is more likely to increase total production of goods and services by more than it increases total consumption, so that the pressure on prices is disinflationary, not inflationary. I pinged Michael Pettis with this question two days ago. "Is Steen saying the same thing as you in a more concise way, or are there differences between Europe and China in regards to lower interest rates." 1. Changes in household consumption (which is most consumption) can be fully explained by changes in household income and changes in household savings rates. By the way, when you are looking for the data, some call "household" what others call "personal" -- it's the same. a) If monetary easing causes household income to rise (by increasing employment), or if it increases household wealth (by increasing the value of equity, bonds and real estate), or if it reduces the desire to save (by reducing the reward for saving, or by reducing the cost of consumer credit), it will cause consumption to rise. b) If monetary easing causes household income to decline (by reducing the return on bank deposits), or if it reduces household wealth (because most savings are in the form of bank deposits, which now have a lower return), or if it increases the desire to save (by increasing income inequality), it will cause consumption to decline. c) In the US, monetary easing seems to reduce unemployment, it seems to increase household wealth on average, because most Americans savings are not in the form of bank deposits, it seems to reduce the desire to save, by making credit cards cheaper, and while it may increase income inequality, on average it seems to have a strong positive effect on consumption. In China monetary easing has little effect on unemployment because unemployment is still low, it seems to reduce household wealth on average, because most Chinese savings are in the form of bank deposits, it seems to increase the desire to save, because Chinese households have a target savings amount for retirement or for their kid's university and lower deposit rates force them to save more to meet the target, it makes credit cards cheaper but there is little consumer credit in China, and it may increase income inequality. On average monetary easing seems to have a weak or negative effect on consumption. 2. Monetary easing can cause consumption to rise or to decline, for the reasons above, and it almost always causes production to rise (businesses can borrow more cheaply to expand facilities). If monetary easing causes production to rise faster than consumption, it is disinflationary. If monetary easing causes consumption to rise faster than production, it is inflationary. My point is about #2. I argue that although monetary easing causes consumption to rise faster than production in the US, it does the opposite in China because most credit goes to production and on average monetary easing seems to have a weak or negative effect on consumption. Steen is discussing #1. He argues that because Europeans have higher savings than Americans, and because most of it is in bank deposits, monetary easing has a negative effect on consumption in Europe, and not positive as in the US. Changes in consumption, by the way, also affect investment because businesses are unlikely to expand production if consumption is weak. In short, Steen's point is very interesting and too-often overlooked. And yes, I agree with your comment that in the US QE “works” mainly by causing debt to rise – in the sense that reigniting the equity and real estate bubble simply encourages households to spend the additional wealth in the form of consumer credit. Instead of inflating bubbles we should either improve infrastructure investment or fix the trade problem. I suspect the bankers that seem to be driving policy prefer bubbles. Pettis did have this caution regarding household savings vs. total savings. "Europe has a higher total savings rate. We know that because Europe has a current account surplus equal to the excess of total savings over total investment. In contrast, the US has a deficit equal to the excess of total investment over total savings. 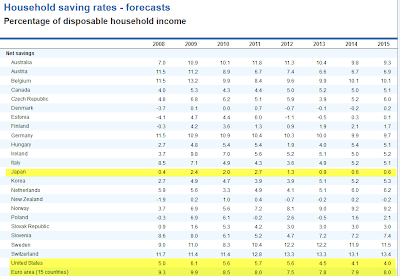 But that doesn't mean Europe has a higher household savings rate. Please check the data," advised Pettis. After reading the above, inquiring minds are likely wondering about the household savings rate in Europe vs. other countries. 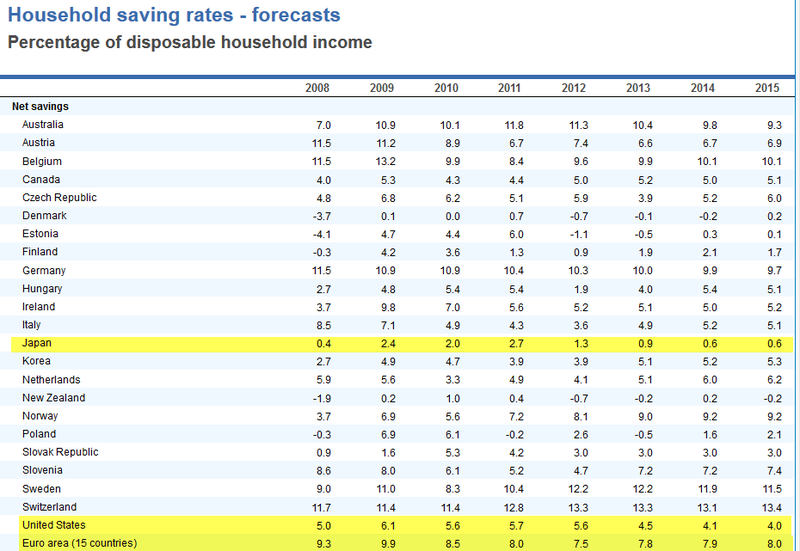 Results from the OECD Household Saving Fate Forecast, an estimate of the percentage of disposable household income saved, may be shocking to some. In the US, it's relatively safe to assume that even following the huge market plunge in 2008-2009, most choose financial assets rather than bank accounts as the primary savings vehicle. Europe may be quite different, possibly because of demographics. Take a look at Japan. There is virtually no saving now, even though there once was. Not only that, but Japan's current account is now in deficit. When I sent Pettis the above OECD link he commented "Wow, remember 20-30 years ago when the Japanese had the highest savings rate in the developed world? We were told back then that Confucian societies just can't help themselves when it comes to thrift." Yes, I do remember. And one need only go back to 2007, not 20-30 years ago. Following are questions and comments in regards to Significant Shifts In Psychology. Typically the questions or comments are about cultural differences in Japan, a belief that printing presses can always defeat deflation, that we are in some sort of 70's rerun situation, public obligations will cause inflation, the Fed can reflate the housing bubble, and comparisons to the Weimar Republic. Too even compare the citizens of Japan to the US is stupid, stupid, stupid Forest Gump! Culturally the Americans are spendthrifts compared to the Japanese. Japan's culture is older than 200 years and culturally they are different and it does matter. The comparison to Japan is hollow, North Americans have become drunk on excess and will keep spending until the repo vans appear in the driveway. Comparisons to Japan are not stupid at all. It is important to understand both current differences as well as trends. The biggest differences are demographics (an aging population and immigration policies) and consumer debt. The former is a deflationary force in Japan, the latter a deflationary force in the US. Consumer debt is an enormously deflationary force when it reaches the point it cannot be serviced. We are at that point now and we face additional deflationary pressures of outsourcing and global wage arbitrage. When it comes to spending one also has to remember that it was not that long ago that the savings rate in the US was 8%. That savings rate steadily declined to the point where it went negative for 18 consecutive months. What cannot continue will not continue by definition. A negative savings rate cannot continue forever. There will be a trend reversal in the US back towards the norm on savings and sooner or later a trend reversal back towards spending in Japan. After a 20 year bout with deflation in Japan it is too easy to say they are a nation of savers. Likewise after a massive 20 year spending spree in the US it is easy to project that trend forever into the future. Neither trend can last forever. The savings rate in the US has only one way to go and that is up. A reversal towards savings in the US will actually be quite supportive of the US dollar. In spite of the above, and ignoring the total failure of both Monetarism and Keynesianism in Japan for decades, Bloomberg author Barry Ritholtz came out today in praise of Central Banking's Grand Experiment. Perhaps it is merely a coincidence, but the U.S., with the most activist central bank and after more than five years of quantitative easing and a zero interest rate policy, has the best looking economy in the developed world. Europe, where Germanic austerity and central-bank timidity prevails, looks the worst. Japan is somewhere in the middle, both in terms of its economic recovery and QE. Preliminary results of these grand monetary experiments are now in and the results are clear: More monetary stimulus equals a strongest economic recovery. In Europe, monetary policy is a prisoner of German paranoia. Hyperinflation of the Weimar era 90 years ago has created a Teutonic form of posttraumatic stress disorder. It is worth noting that opponents of central bank intervention and deficit spending in the U.S. have issued similar warnings for the past six years -- first inflation, then hyperinflation, then the inevitable collapse of the dollar. The U.S. is now winding down its QE program, with the expectation that the economy is strong enough to withstand slightly higher interest rates. Europe remains the slowest economy, with (not coincidentally) the weakest monetary and fiscal response of the developed nations. The euro-zone's misguided embrace of austerity has consigned the region to an economic holding cell that will be hard to escape without bold steps. A new court opinion has now cleared the way for the ECB to join the U.S. and Japan in a bond-buying program. We will soon find out whether it has the brass to do so and join in central banking’s grand experiment. Ritholtz is a friend. Nonetheless, a point-by-point rebuttal is appropriate. His entire thesis can be summed up as follows: "It worked here, so it must work everywhere, even though circumstances are not the same." He ignores savings rates, methods of savings, demographics, cultural differences, distant history, and even recent history. Europe and Japan are not the US. Demographics are different. So is culture. So is history, even if over time (great periods of time) things average out. I wonder how anyone cannot see the total and complete failure of Japan, a country that tried for decades to defeat deflation while going from the world's largest creditor nation to the world's largest debtor nation in the process. It's easy for many to sympathize with Ritholtz's statement "It is worth noting that opponents of central bank intervention and deficit spending in the U.S. have issued similar warnings for the past six years -- first inflation, then hyperinflation, then the inevitable collapse of the dollar." However, I was not in that group. Ritholtz conveniently lumps all inflationists together as if they were the only ones opposed to Fed interventions. The clear fact of the matter is as follows: Even though I staunchly opposed Fed intervention, I maintained this entire time that hyperinflation or even high inflation (as measured by consumer prices) was nonsense. Ritholtz fails to look ahead. Presumably, what worked before must work again, in other places, even though times have changed and the circumstances are different. If Your Job Benefits From Bubbles Can You See Them? "And yes, I agree with your comment that in the US QE “works” mainly by causing debt to rise – in the sense that reigniting the equity and real estate bubble simply encourages households to spend the additional wealth in the form of consumer credit. Instead of inflating bubbles we should either improve infrastructure investment or fix the trade problem. I suspect the bankers that seem to be driving policy prefer bubbles." Indeed they do. And so do most in professions that depend on bubbles. The psychology of bubbles for those depending on bubbles is such that it pays not to see them! Imagine the real estate broker in 2006 advising clients not to buy! Like it or not, Ritholtz and most in my profession are in the same boat. Advising clients to get out of the market or buy assets that are not rising in price is a damn hard thing to do. This is not an accusation against Ritholtz personally. This is simply an honest reflection of human psychology. It is far too early to conclude as Ritholtz did "Preliminary results of these grand monetary experiments are now in and the results are clear." At least he said "preliminary". I maintain that all the Fed did (and has ever done), is blow bubble after bubble, with increasing amplitude over time, to the sole benefit of the bankers, the asset holders, and the political ruling class. The 2000 dotcom bubble was superseded by the housing bubble which was superseded by the current equity and junk bond bubbles, all in the futile effort of stopping recessions, fixing the business cycle, and preventing deflation. The psychology of the current asset bubble is like those that preceded it. Most people will not understand there is a bubble now until it pops. It was far easier for stock advisors to spot the real estate bubble than it is to spot the equity bubble now because stock advisors are generally not in the real estate business. Still, some missed it, others didn't. Regardless, here's an obvious fact that most still cannot see: You cannot cure a deflationary debt hangover by forcing more debt into the system. Such efforts may appear to work in the short run (in specific situations as noted above), but it's all an illusion papered over by bubbles of increasing size. And here's the irony: “At least we tried [to create inflation]” is not only the essence of the rising income inequality problem that Fed Chair Janet Yellen (and countless others) moan about, it's also the very essence of the ever-increasing debt problem the world faces. Ritholtz offered his epitaph. Here's mine. It's in regards to today's central bankers in general, written from the perspective of future historians. "These fools thought the world needed 2% inflation, thought they could end the business cycle and recessions, and thought they could steer the global economy like a car on a curvy, mountainous roadway. The actual result was a series of economic bubbles of increasing magnitude, culminating with the currency crises of [date]." Lacy Hunt at Hoisington Management pinged me with this interesting thought: "Academic research indicates that QE in the US contracted rather than expanded economic activity, just as it did in Japan. Thus, Steen could have made the even stronger case that since it didn’t work in the US or Japan, it will not work in for the ECB." To that I will add, I am positive Lacy is correct. Any alleged economic benefit of QE was a monetary illusion coupled with enormous "temporarily" hidden costs.